Where are you in Charlotte? Some companies will. However, a week is a very short time. I have a student now and will get another when he's done. I will go home after that. I would be happy to give you a truck tour and tell you some of my more embarrassing stories. Good luck. I am in Matthew's but can come anywhere, please let me know whenever available. I am in charlotte, NC. 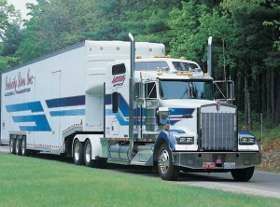 Do certain companies allow a individual to ride with a trucker for a day and see for them what trucking is like. Need to join a company sponsored training. I need to make a certain amt due to financial obligations. Which company I can get the most bang, during training and after. 1) is attending a community college or joining a company for cdl. Which is better. 2) my wish list for job, please recommend a company to start as total newbie. A) no touch. B) want to drive in south thru south west and west. Non snow areas. C) good tricks with TV. Cool sleepers etc.